The full and lasting impact of the 2013/14 winter storms on Devon and Cornwall’s coastline will be explained to audiences at this weekend’s Port Eliot Festival. As part of the festival’s first ever Science Lab, scientists from Plymouth University will speak about their research into the storms which wreaked havoc across the region. 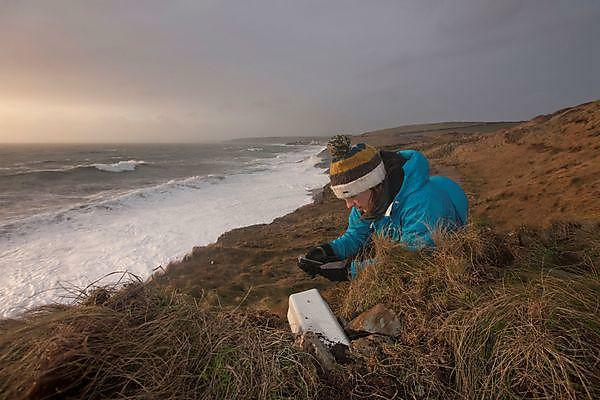 During the storms, the University’s Coastal Research team used cutting edge technology to assess the strength of the waves that were hitting coastlines along the South West, and examined the damage caused to cliffs and coastal communities. Combining that with data captured across western Europe, they were able to show the storms were the strongest to hit Europe’s Atlantic coastline since 1948 and that extreme wave conditions occurred up to five times more frequently in 2013/14, and winter wave heights were up to 40 per cent higher, than on average. The team has also led research which has recorded lasting damage to beach systems, and explored ways to prevent the catastrophic impacts for coastal communities should such severe storms be repeated in the future. Dr Claire Earlie, who will give the talk at Port Eliot, was studying for a PhD in Coastal Geomorphology at the time of the storms. She was part of the team that installed scientific instruments on the top of cliffs near Porthleven, which demonstrated they were being physically shaken 100 times greater than anything ever recorded, causing cliff retreat over 100 times larger than the long-term average. Plymouth University is the official Creative and Cultural Partner of the Port Eliot Festival, taking place in South East Cornwall from July 28 to 31, 2016. And this event – taking place on Friday 29 July at 2.30pm – will be one of a number of showcases of University talent and expertise as part of the first Port Eliot Science Lab. Being staged in the Round Room at Port Eliot, it will give festival goers the chance to explore science, see performances and take part in a range of experiments.